If you have had your eye on an Apple Watch for a while, you’ll probably be excited to get your hands on the new Series 4, but choosing which design might be for you (or whether you would get all the features you need from the cheaper Series 3) might be a tougher decision. To make life easier, we’ve broken down the options for you, comparing everything from screen size, design and fit, to the nitty gritty of processing power and more. 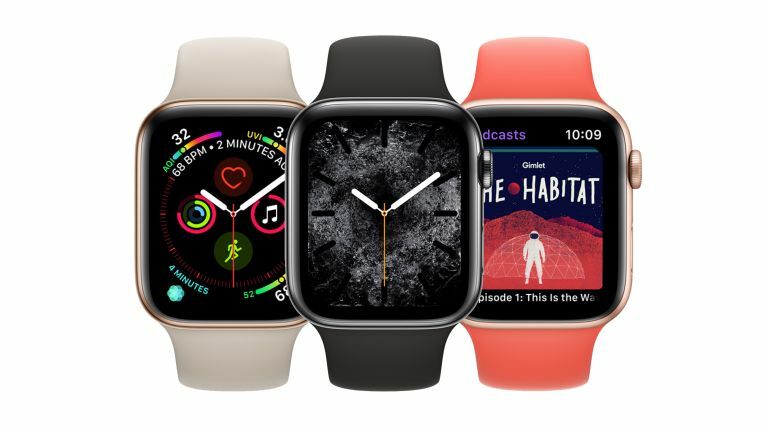 Despite looking pretty similar, there are lots of differences between the Series 3 and Series 4 watches - not least the price, as the new Series 4 + Cellular starts from £499, while the equivalent older model is £379. Aesthetically, the Series 4 is considered to be better looking. It has a 30% larger screen and is thinner, with more metallic colour options, a louder speaker, a ceramic back plate that’s meant to boost reception and the new digital crown with haptic feedback, which is used to navigate the watch's features. One other big difference is what's inside the watches. The new one has an S4 64-bit dual-core processor and is up to two times faster than the S3 processor in the Series 3 Apple Watch. It also comes with a second-generation optical heart sensor and an electrical heart sensor, allowing it to do a whole lot more health monitoring including ECG tests. However, there are lots of similarities too, which are worth considering if you are not hell bent on having the latest model and are looking for extra value for money. Once you’ve chosen between the two available models (Series 1 and 2 have been discontinued) you’ll need to consider which size of watch face you prefer (there are two choices) and whether you want it to have the ability to make calls via your phone network, as cellular connectivity comes at a price. The standard GPS watch starts at £399 for the Series 4 and £279 for the older Series 3, while the cellular equivalents are £100 more expensive in both cases. So just what do you get for the money? The cool ability to make phone calls from your watch, thanks to an electronic SIM card inside the GPS + Cellular models. As well as the higher price of the watch itself, you'll incur extra running costs for data usage and network fees, so it’s worthwhile thinking about whether you really want this feature. If you do (and aren’t that bothered about extra health monitoring) it’s worth considering that a Series 3 + Cellular is still cheaper than the Series 4 without the ability to make calls. But if you’re someone who has their phone with them all the time, you’ll probably want to plump for the cheaper GPS versions and save your pennies. Last but not least, you’ll want your watch to look good, and there are a lot of decisions to make. The watch’s body comes in aluminum, which is the cheapest option, or stainless steel, with lots of colours and materials to choose from for straps. There are even offerings from Nike and luxury fashion house Hermès. Surprise! The most modern Apple Watch is the best Apple Watch! ‘All new. For a better you’ is how Apple describes its Series 4 watch. If you’re an Apple fanboy this is the one you want, and it does pack more of a punch than its predecessor. On the outside, the watch is sexier, with 30% more screen and nicely curved edges that makes for a more rounded appearance and allows imagery and the watch’s touch surface to go right to the edge of the screen. This means, for example, the new ‘Infograph’ watch face can accommodate up to ‘eight complications’, so you can see more and do more at a glance, including clicking on a photo of a friend to give them a call, or checking out some fitness stats. And it’s thinner too. Like all Apple Watches, the Series 4 has a Digital Crown, allowing users to scroll without obstructing the display, only the new one has haptic feedback to deliver a pleasing ‘precise, click-like feel as you scroll’. But there are bigger changes beneath the watch’s shiny exterior. The Series 4 is the most powerful Apple Watch yet thanks to the new S4 chip, which makes it twice as fast as its predecessor, while an inbuilt speaker is 50% louder, providing better audio quality for Siri and Walkie-Talkie functions. All these little changes, including a more efficient display, means the watch has up to 18-hours of battery life on a single charge, according to the company (although, we've found this is an underestimation). As well as its looks and hi-tech spec, Apple is boasting about the Series 4’s new health and fitness capabilities. On the back, the optical heart sensor present on the first three iterations has been upgraded. It can now even do ECGs thanks to the new electrical heart sensor. It lets you check your heart rate and notifies you if it’s above or below your specified threshold and there’s Fall Detection and Emergency SOS, which could prove handy for more vulnerable users. All your heart data, as well as information from health and fitness apps, is collected in your iPhone Health app. Activity, sleep, mindfulness and nutrition are highlighted there in one snapshot too. While the Apple Watch has always been pretty handy for runners, it now includes yoga and hiking thanks to a more flexible Workout App, which automatically detects the type of exercise you’re doing. You can set individual goals, measure your calorie burn and track your progress over time in the Activity app too. For example, with a gentle tap, new pace alerts let you know whether you’re ahead of or behind where you want to be. You can also pair your watch with compatible gym equipment by tapping. Like the Series 3 before it, the new watch is water resistant to 50 metres but it has a cool new function that allows it to eject water from the speaker with a burst of sound. If money is no object, then you might like to consider the Apple Watch Hermès. The ultimate high-tech fashion statement, the watch has specially designed faces and hand crafted leather straps. But under its stylish bonnet, the Apple Watch Hermès is the same as any other Series 4. When it comes to straps, the choice is wide. The extra-long strap of the Double Tour wraps twice around the wrist and is available in four colour-ways. Then there's the classic Hermès design with a buckle inspired by a horse's saddle, also available in four colour-ways and there's a hidden deployment buckle version too. The strap, which is available in a choice of two colours, opens with a click of the two side buttons. There's also a rubbery Sport Band in signature Hermès orange and a more luxurious 'Single Tour Rallye' strap in Fauve grained Barenia calf skin, which references the design of a classic Hermes driving glove - i.e. it has holes in it. But these designer straps come at a hefty price, with the watches costing between £1,249 and £1,499. It’s worth remembering that for the same price you could splash out on a Series 4 and a seriously luxurious handbag or holdall for the same price, making this watch one for collectors. This watch has all the standard Series 4 software features, including the sports and health ones, but is a sporty iterations designed for gym enthusiasts and athletes. The big differences are the straps available and on-board apps. There are two types of straps - one rubbery ‘particle’ design with air holes to keep your sweaty wrists cool, and another fabric version - the Nike Sport Loop - with reflective thread for those who like to run in the dark. The Nike + Series 4 watches are some of the cheapest at £399 and £499 depending on connectivity, making them a great option for those who like the latest fitness gadgets. The Apple Watch Series 3 may not be as exciting as the newest counterpart, but it offers some serious bang for its buck, with any of the ‘essential’ features covered for £100 less. Yes, it’s slightly chunkier with a smaller screen (42mm or 38mm), but it still have the ‘digital crown’ for easy and unobscured navigation, the same capacity level of water resistance and optical heart sensor. This means that it can be used for all the main exercise and health functions, but may not support the latest apps that make use of the Series 4’s electrical heart sensor, for example. The watch has Apple’s ‘Activity Rings’, which show the ways you move each day at a glance and lets you track your exercise easily, while the sensors monitor your heart rate and the Breathe app can help you manage stress. You can download a choice of health apps too. If you plump for the cellular version of the Series 3 you can make a call without your phone, just as with the Series 4. And you can also ask Siri to send a message, stream your favourite songs and uses emergency SOS if you need it – just like with the newer watch. Of course there are some drawbacks of buying an older model. For example, it as Apple’s S3 processor, which isn’t as fast as the S4 but this won’t a problem for people using it as an ‘extra’ device or as a fitness aid. And for fashion fanatics, its face isn’t as complex and there is no gold hardware option. The watch is also only available in aluminum, but on the upside, that keeps the cost down. And the screen isn’t quite as clear or as efficient as the Series 4’s, which takes its toll on battery life. In short, the Series 3 offers a lot of the most important features, but is slightly more sluggish and lacklustre, with the possibility that some high tech health apps using the electrical sensor, may not work. But, if you’re looking for a smart watch that looks great and offers all the main capabilities at a good price point – from £279 - the Series 3 might be for you. Moving back even further still is the Apple Watch Series 2. This model was released in September 2016, so it's getting on a bit now, but, if you're looking for the cheapest (but still good) Apple Watch model, then this is it. The Series 2 still has all of the main features covered, such as notifications on your wrist, a selection of apps, fitness features, and compatibility with all stands, docks, chargers, straps and accessories. It even has built-in GPS, but no option for cellular. The ageing Apple Watch also falls slightly short when it comes to processing power, battery life, and durability (this one isn't waterproof, so you can't use it to track swimming). In short, the Apple Watch Series 2 offers a lot of functionality in a device which can be had for less than £200. It's ideal if you're still unsure whether you'll like a smartwatch. It'll quickly become outdated though, and will make you wonder why you didn't just by a Series 4 in the first place.